New homes and thankful hearts! I'm sure you remember our story about the wild kittens from two weeks ago.Well here is the one that our neighbors here in Beulah adopted, and as you can see, he is enjoying the good life now! No more rodents, birds and neighborhood scraps for him, and he even has an older "step-sister" to play with and teach him the ins and outs of domestic life, complete with toys and a video collection! And the Lord has been taking wonderful care of us also. 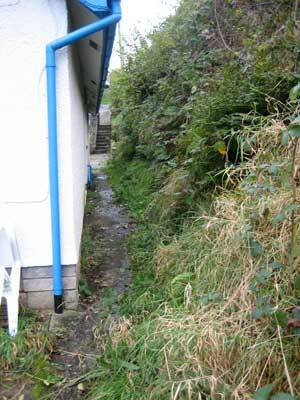 Since late last week we have begun the clean-up outside our new home in Cilgerran. There is much to do yet, and while we are busy outside, the owners are hard at work inside with painting and finishing the many details after remodeling. Their aim is to be done everything so that we can move in two weeks from this coming Saturday! In the previous entry from October 23rd. 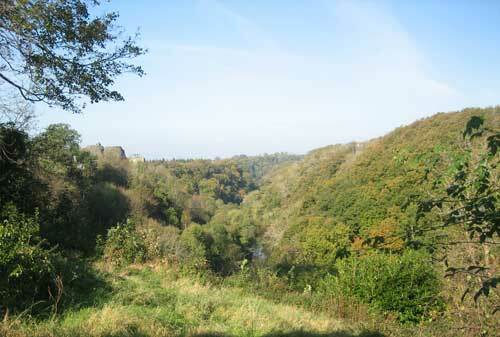 you can appreciate the excellent view over the Teifi River valley. In the distance on the left are the remains of an 11th. century castle. And although we'll be living right in a town, we are out of the way and our place is quite isolated and private. This week we will be concentrating on packing up things in Beulah, as well as cutting back the overgrowth that makes the house seem so closed in by the bank above. We were a bit concerned at the first viewing because this "wall" seemed to be buckling towards the house and we wondered how stable it was. Actually this whole area was an old slate quarry, and the house sits on a ledge of solid slate! Speaking of solid places, our times at the chapel are still very much the central focus of our intercessory work here, and this gives a real foundation to everything else that we are doing here. Even this unexpected move to be so much closer to the chapel is a real blessing, and only could have been orchestrated by the Lord! It seems to indicate a new phase where proximity to the chapel will be important. Sunday evening I spent some time in the chapel after working a few hours at Hen Ffynnon, and had a tremendous encounter of brokenness and intercession through reading Daniel's prayer in the first 19 verses of chapter 9. I wasn't able to read through more than a few phrases at a time without stopping to pray with deepened insight and agony. It was a truly amazing time. I was alos overcome time after time with the Lord's overwhelming goodness at giving us this new home. Indeed as Daniel says in verse 4, "Oh Lord, great and awesome God, who keeps His covenant and mercy with those who love Him, and keep His commandments." "The Ancient Well" is ours!! THANK YOU JESUS!! Last week we found a house that we think might be just right. It is located in Cilgerran, almost directly across from where we stayed 8 years ago when the Lord gave me an amazing vision of another and greater Welsh Revival. 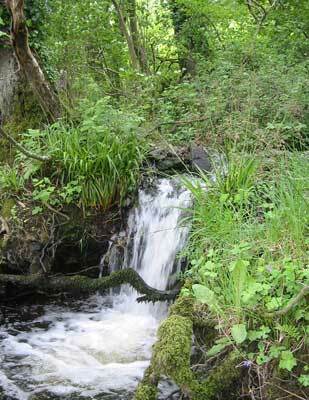 This cottage is located down off the street away from the noise of the village, overlooking the Teifi River valley. It seems to have everything we need, even two extra bedrooms for guests. As you can see here in the foreground, it is all wildly overgrown, having been unoccupied for two years, but there was even an old vegetable garden on a lower terrace! The task to reclaim the flower gardens and make the land productive again will help us in our prayers as it is representative of the condition of most of church here in the U.K. And it is only three minutes from the chapel by car, rather than the present fifteen, so we can even walk on nice days! This update is to declare the goodness of the Lord! We met the owners of the cottage and made an agreement about our renting it for the long term. And we will be making our home there as of December 1st! The name of the house is "Hen Fynnon" which means "Ancient Well" in Welsh. Is not our Lord awesome in all that HE does? The night before, we had a small prayer meeting here in Beulah, and our friends asked if we'd like prayer for the the meeting with our future landlords before they left, and there was a word that the expression "too good to be true" was going to disappear from our vocabulary because it is now "it is so good because He is True!" A heartfelt thank you to each one of so many of you that helped us pray for this need, and your expressions of shared joy with us at God's wonderful faithfulness. Amen, and Hallelujah forever! Since we've been in Beulah these two years, there has been a stray cat that we see hunting at times in the fields and feed scraps to outside. 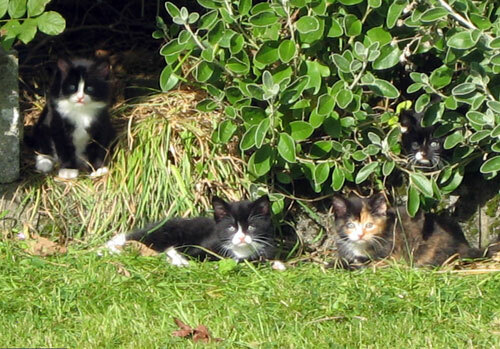 Well, three weeks ago we discovered that she has a litter of kittens living in the hedge in our front yard. They are so cute, and we wondered what would become of them. From a chat with the neighbor we learned that she had kittens once before, but that they all died. 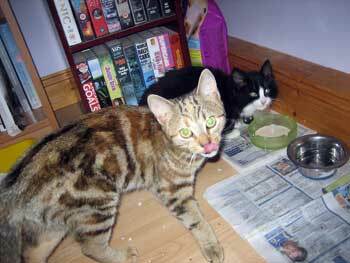 So we got in touch with the RSPCA who provided us with a trap, and last Monday caught the mother, had her spayed, and let her the next morning. Then Friday we set out the trap and caught three of the kittens! Apparently one did not survive, but the good news is that by Saturday all three had new homes with people to love and care for them. Later that day we were praying with Gladys about our housing situation. We still haven't found a place and we are learning to trust God in spite of the uncertainty. And suddenly that situation of these kittens came into focus for us. If the Lord could find homes for three wild kittens that need to be tamed and domesticated, he can certainly found a place for us too. So are being comforted and assured that we are in Good Hands! So what's the connection, you might ask, between wild kittens and intercession? Well, it really is pretty simple. These little creatures have had to survive on what their mother has been able to provide. She brought in two rabbits to feed them last week. Although they would eat some of what we put out for them in the hedge, they wanted nothing to do with. When we tried to get close, they ran off into their hideaway in the hedge. 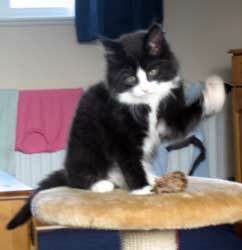 If they knew how good life could be as a domestic kitten, with food, toys and affection, they'd have come running! And it is just like that with people and God's love, forgiveness and salvation. If they had any idea of the goodness of the Lord, they would come running too! But no more than these kittens can imagine, can people know of God's love unless the Father draw them. 11 "For thus says the Lord GOD: 'Indeed I Myself will search for My sheep and seek them out.'" 14 "I will feed them in good pasture, and their fold shall be on the high mountains of Israel. There they shall lie down in a good fold and feed in rich pasture on the mountains of Israel." 25-26 "I will make a covenant of peace with them, and cause wild beasts to cease from the land; and they will dwell safely in the wilderness and sleep in the woods. I will make them and the places all around My hill a blessing; and I will cause showers to come down in their season; there shall be showers of blessing." Thank you for your prayers for us, and for Wales! 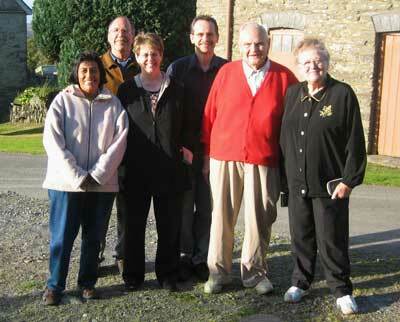 Over the last few weeks we have had the blessing of some special visitors to our part of Wales. The Morgan family first got in touch with us back in June, having found our web page while researching the Welsh Revival. They had plans to come over to visit Wales and check out the land of Paul's ancestors, and having a heart to pray for worldwide revival, decided to spend a day with us. It was a real blessing and of great encouragement for us all. And much to our surprise and delight, they spoke some Spanish, and knew several worship songs (coritos) so we had a great time worshiping in Spanish in our little Welsh Chapel! "None of the four of us can express the joy we feel as we contemplate the effort you dear folks are making in an ancient land that was once the world center of a Revival of inestimable impact! We have all (Doris, Paul, Valerie and Keith) been praying that the LORD will carefully guide you as you seek to win not only the confidence, but also the SOULS of your dear neighbors round about you! The impact our visit has made on the four of us cannot, in these few words, be captured! Surely The Father has great plans for WALES once more!" AMEN! Then the following week Allan & Enid Thomas from Llanelli spent a week at a holiday cottage attached to the Beulah post office. We first met them through our involvement with the Celebraton for the Nations, and it was wonderful to have them as neighbors! We went together to the chapel to pray several times, and really had some blessed and precious hours together in God's presence, pouring out our hearts for His mercy and grace to spread over this land once again. Times like these are a wonderfully refreshing for us, and really help move things along in the spirit. We know progress is being made through our prayers, and having reinforcements from time to time by people with such a heart for intercession is really a strengthening for us. And through joining our hearts and standing together in prayer for Wales, the Kingdom of God is advancing, and we know the Spirit of God is moving throughout Wales. Everywhere there is a growing sense of expectancy, and people are responding with more prayer. I also received an email a couple weeks ago from someone livingjust outside on Wales in England. He said, "A little after I had started (visiting a church) there God made it clear to me that there would be a revival in Wales. I found great joy in praising Him for this. One day about 5 months ago as I was sitting at the dinner table I saw a vision which must have lasted a micro second but it seemed like I was looking at it for a long time it was like something that was released from my spirit to my mind and God immediately gave me understanding. it was a map of Wales and as I looked at it little neon lights were going on in different places. When so many of the lights were shining there was a flash of light that shone right across Wales a bit like sheet lightening. The understanding was this. The neon lights showed up little towns and villages in Wales where people were praying for revival. 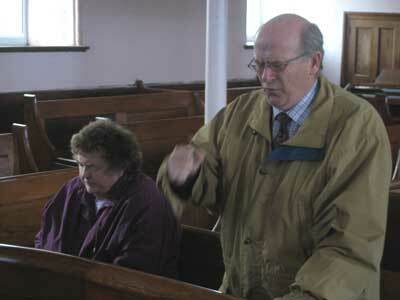 The great light was God moving across Wales and effecting the whole land for a time." Isn't our God awesome? "And the Spirit of God moved upon the face of the waters. And God said, Let there be light: and there was light." Seeking low and seeking HIGH! - "The Lord has a high place for you all already assigned." - "Shalom from Jerusalem, just to send you love & let you know we're praying for you, that you are in His will & that the enemy will not be able to disrupt." - "will be praying even on Sundays at the church meetings in Guatemala City. We love you guys!" - "will pick up this challenge and pray. Temptation to be disappointed has to be strong, but lean back! Envision yourself in a large inner tube with hands clasped behind your head, being moved along downstream in the will of God & enjoying the ride! That's what I do. There's just no way you can lose and soon you will be looking back and thanking the lord for His exquisite leading." Isn't the Lord awesome? He truly will never leave us or forsake us, and we are already guaranteed not to be left out in the cold and wet Welsh winter - a few friends have kindly offered us short-term properties if by the end of November we haven't found something more permanent. We still have two months to look, and are sure something suitable will show up. It has only been a week, but this unsettled-ness has been teaching us a new angle for prayer. Although we can feel a bit precarious if we let the domestic situation get to us, we have such a rock-solid confidence in Jesus that we know nothing can move us. However as we consider the multitudes without Christ who try to base their security on temporary things, we realize what a blessed privilege we have in knowing Him! We know that the people of this world have a hunger in their hearts for "something more." They have a different kind of unsettled-ness, a hidden or misdirected longing for Life and Truth, but they don't quite know where to look or even what they are looking for! As Paul puts it in Ephesians 2:12, "remember that at that time you were separate from Christ, excluded from citizenship in Israel and foreigners to the covenants of the promise, without hope and without God in the world." Just this afternoon we stood on the steps of a cute little house with very nice gardens, a small greenhouse, and even a babbling brook and chorus of songbirds in a wooded glen. Of course there was a longing to have a nice secure earthly home like that, but we are learning to count it enough to be at home together in Him, and know that our work and calling is for His Kingdom to come for the "eternally homeless" whose situation is infinitely worse than our momentary discomfort! And so even our new task of looking for a home has added a new facet to our prayer lives here. Thank you for your prayers!